have the 10th Panzer moved to a different location where they can be evacuated back to mainland Europe. Shortly thereafter, the camp is attacked and Stauffenberg is badly injured, losing one of his eyes, his right hand, and two fingers from his left hand. The next scene shows Hitler visiting a base camp in Germany, and a nervous General Trescow onlooking. replacement, which Olbricht does, and bring Stauffenberg to one of the clandestine meetings. Trescow is sent to the front lines. Stauffenberg is promoted to head of the plan, and he, along with his assistant Lieutenant Haeften, take the order to the Berghof to be signed off by Hitler himself. Hitler, with his inner circle present, praises Stauffenberg's loss of appendages as the attitude necessary for his military, and states Stauffenberg is the ideal German. He then signs off on the bill, saying he's sure the changes are adequate. 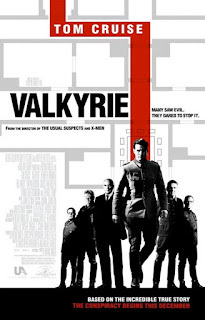 Back at command, a Colonel Quirnheim shows the dissenters how to use pencil detonators, and Stauffenberg persuades a General Fellgiebel, who controls communications at the Wolf's Lair, to help. without his permission. He tells them that if this happens again he will arrest them both. Dr. Goerdeler has a warrant issued for his arrest and General Beck implores him to leave the country. Goerdeler, Stauffenberg's chief opponent on the committee, hastily leaves and is replaced by Colonel Quirnheim. Colonel Stauffenberg visits his home and tells his wife his plan, and that she and his children must leave, because of their suffering if he should fail, they do so, and Stauffenberg makes his next attempt on Hitler's life as he attends another military debriefing on July 20, 1944. Much to his surprise, the meeting has been moved from Hitler's bunker to an open window summer hut. The blast would be most effective in the pressurized bunker, where the thick walls would deflect the pressure back to the bomb's origin, wiping out everyone in the bunker. Stauffenberg plans to proceed anyways but then notices Himmler is once again not present. He calls the committee to ask permission to continue and they say no, but Stauffenberg and Quirnheim privately agree to continue anyways, and Stauffenberg enters the summer hut. He and Haeften arm the bomb in a washroom and place it under the war room table, as Haeften gets the car. Fellgiebel gives Stauffenberg his distraction call, and Stauffenberg hastily leaves the hut. In the war room, an enraged Hitler bangs his fist against the table, knocking Stauffenberg's briefcase, with armed bomb inside, over. A correspondent at the table sees Stauffenberg's fallen bag and moves it behind a table leg opposite Hitler. As Stauffenberg walks to his car, the bomb detonates. him. He makes it back to the airfield, and quickly flies a plane back the government district of Berlin. commands Werner to release all SS and capture those in charge alive. Remer cancels the occupation of Berlin and marches to Stauffenberg. Rumors are swirling that Hitler is alive, which Stauffenberg dismisses as SS propaganda. Butgradually, Stauffenberg's associates in headquarters are defecting. The Reserve Army reaches headquarters, and Stauffenberg, Haeften, Quirnheim, Olbricht, and Beck attempt to leave. All are captured, and General Fromm is released from his cell. Wanting to appear innocent, Fromm orders the immediate arrest of the conspirators. In his office, he condemns Stauffenberg, Quirnheim, Olbricht,Haeften, and Beck to death, but allows Beck to kill himself with a pistol. The remaining four are taken outside and simultaneously executed by firing squad. Meanwhile, GeneralTrescow, hearing of the failure, is shown committing suicide on the front lines with a grenade. Goerdeler is shown executed by hanging, and eventually Stauffenberg is brought before the firingsquad. Quirnheim and Olbricht have already been executed, and only Stauffenberg and Haeften remain. Stauffenberg is prepared to face his death when Haeften steps in front of him, taking the firingsquad's first shots, and falling dead. The firing squad reloads, and aims at Stauffenberg, who screams "Long live sacred Germany," before falling dead. Witzleben is shown publicly denouncing Hitler in a trial, and the film reveals he took was executed. Then the film states that General Fromm's hasty executions could not save himself, and he too, was executed for not reporting the conspirators. The film concludes with a byline announcing Hitler's suicide less than a year later, and reveals that Stauffenberg's wife and children survived.